Just before Boltz was to open in the fall of 1972, a fire burned down most of the school. Determined crews immediately set about rebuilding the structure from the ashes up, and the school opened January 29, 1973. The Phoenix mascot embodies the renewal of the school after this event and serves as a proud symbol of our school today. We encourage our students to become lifelong learners and responsible citizens. 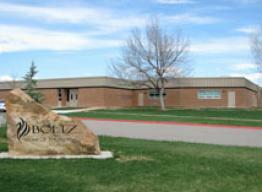 Boltz is a place where respect, rigor, relevance, responsibility, and relationships drive learning. Our staff members provide a nurturing, safe environment founded on a culture of respect and understanding with a commitment to the academic, physical, social, and emotional growth of students. Boltz prides itself in offering many curricular options. Students in all grades may choose Pre-Advanced Placement and other accelerated classes. Our wide variety of elective classes include band, orchestra, choir, musical theater, engineering explorations, art, yearbook, varied computer classes, Spanish and German, and Student Council. As an Advancement via Individual Determination (AVID) school, Boltz employs AVID strategies across all content areas to better equip our students for high school and post-secondary success. Because we believe that athletics and activities serve the valuable purpose of extending the learning and relationships that take place during our school day we offer a myriad of clubs and activities. Our school sponsored clubs and activities include Student Council, WEB Leaders, Math Counts, Odyssey of the Mind, Lego Robotics, and athletic conditioning camp. Student initiated clubs offered are too numerous to mention and change each year based on student interest. Boltz also has a long history of strong athletic programs with more district championships than any other middle school. We encourage all our students to participate in athletics and/or activities to promote their individual growth and development.